Last week, we told you about Google’s selection of 2014’s best Android games, and now it’s time to take a look at another temporary category that can be found in Google Play: Festive Games. Obviously, this category includes games which should get you in the mood for Christmas. While a lot of them aren’t specifically made for this time of the year, they’ve been recently updated with Christmas levels, graphics, and more. We’re not going to present you each of the 46 games included in the Festive category (some of Google’s selections seem a bit weird anyway). Instead, we’re showcasing 10 of the games that appear to be the highlights of the batch. For the rest of them, hit the source link below. Obviously inspired by Disney’s blockbuster animated film Frozen, this is a puzzle matching game that looks great. The latest update brings 45 new levels, Christmas lights and ornaments, gingerbread cookie collectables, and new present (gift) power-ups. You start by playing with only two Frozen characters (Elsa and Anna), and unlock others as you progress. Yep, The Simpsons: Tapped Out has a Christmas update! It seems that Santa is in some serious trouble and you will have to help him by gathering presents and solve challenges. Holiday decorations, new buildings, and new characters are waiting for you. Despicable Me is a game that’s appreciated by tens of millions of Android users, who will - most likely - be glad to see that they can now play in a brand new area: the Arctic Base. As you wander through the Arctic Base, you need to complete a holiday quest: help Dr. Nefario recover lost gifts and decorations. There’s a new Snowboard mini-game that can be unlocked when the quest is completed. CSI: Hidden Crimes (based on the CSI: Crime Scene Investigation TV series) is another popular game that’s been updated for Christmas. 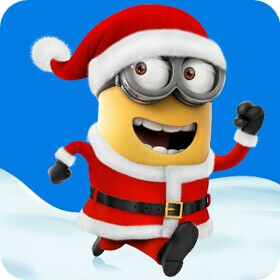 You can "Santa up" your avatar, and access a full Christmas episode for free. Now go solve some thrilling cases, will you? This action strategy game is set in a sky filled with floating islands and lots of warriors and armies. With the latest update, Cloud Raiders lets you battle Mad Santa and his Elf crew to save Christmas. Sounds like a fun thing to do! Doodle Jump has been around for quite some time, but this Christmas Special edition is the one that you’ll probably want to play right now. It’s got new art, new challenges, new monsters (including some that can freeze you with their breath), a “super cool rocket”, and more. The regular edition of Lords & Knights is a medieval MMOG (massively multiplayer online game). The X-mas Edition certainly falls into the same category, but it has Christmas written all over it - from special music to candy canes, snow-covered lands, and hidden animations. Rumors have it that Santa himself can be found in one of your castles. This fun-to-play connecting puzzle game includes no less than 150 Christmas levels. It may look simple, but it can take days and days to master. Download (free, with ads; no in-app purchases). More puzzles? Right on! With this game, you get “the most realistic jigsaw experience” available on a smartphone, and you can select to solve puzzles made of up to 1600 pieces. Scramble with Friends is one of the most popular word games available on Android. Its latest update isn’t as Christmassy as you’d expect, but it does add some fun new art to get you into the holyday spirit. That said, this is the same addictive word puzzle game that lets you play against friends, or folks around the world.